CHIANG RAI – Methamphetamine drug cartels in the lawless jungles of eastern Myanmar are flooding neighboring countries with meth. In Thailand, Buddhist monks have been caught using the drug and the government is trying in vain to stop the flow. At the “Wat Kathu” temple on the Thai island of Phuket, a bald monk sits in front of the prayer house with a cigarette hanging from the corner of his mouth. Taking up most of the space inside are display cabinets with amulets for sale. The temple abbot blesses Chinese tourists who arrive every half hour in buses. Diligent monks collecting alms in the city are nowhere to be seen. Even if the monks here don’t seem to be the most pious, they were very surprised when Thai drug police pulled into the temple’s parking lot in December. The drug-using monks had to hand over their saffron robes on the spot and were arrested. They were also expelled from the Buddhist community and have to take part in a government rehabilitation program with other drug offenders. The defrocked monks of Wat Kathu are only a small part of a growing nationwide drug problem in Thailand. An estimated 70 percent of prison inmates in Thailand are behind bars on drug-related offenses. At least 300,000 Thais are currently in one of the country’s numerous rehabilitation centers. According to a report by the National Narcotics Control Board (ONCB), 240,000 of them are under the age of 24. In response, Thai authorities have declared a war on drugs. “The military must take strict measures to stop the flood of drugs,” said Deputy Prime Minister Prawit Wongsuwan at the end of October. Since then, military and police commandos have been on the move throughout the country, hunting both dealers and users. Over 120,000 drug abusers were arrested in November alone. Thailand’s new drug interdiction brings up memories of the 2003 “war against drugs,” started by former Prime Minister Thaksin Shinawatra. It resulted in more than 2,500 deaths. At the time, Thaksin told narcotic task forces that “suspects should only go two ways, either to the cemetery or behind bars.” The drug police were essentially given an unofficial license to kill. According to human rights organizations, several hundred people wrongly accused of drug trafficking were killed. Thailand’s latest war on drugs has already claimed several dozen lives. However, no cartel bosses have been killed. The casualties have mostly been small-time drug smugglers coming from mountain villages in eastern Myanmar. 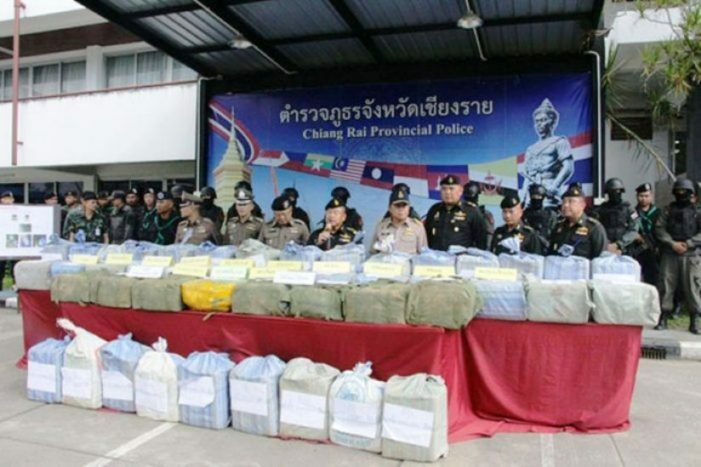 Thai authorities like to highlight the large quantities of drugs being confiscated. “In November alone we seized goods with a street value of 4.5 billion Baht (€121 million, $137 million),” the military said. But these tons of drug seizures are only a drop in the ocean compared to the enormous wave of synthetic drugs surging into the Thai kingdom every day. “Exact figures won’t be available until February, but the quantities of synthetic narcotics currently flooding Southeast Asia are many times higher than last year’s record figures,” said Inshik Sim of the United Nations Office on Drugs and Crime (UNODC). Estimates are that drug investigators confiscate only 10 percent of total production. A voice shouts from behind a bamboo fence, stopping me before I can cross the border into the mountainous “Special Region 4,” an autonomous zone inside Myanmar’s Shan State. The country’s military cannot access the area, which is controlled by different rebel groups. Foreigners are also often barred entry. The area has been cordoned off with wooden planks. “Kengtung, Kengtung!” the border guard mumbles, chewing nervously on a betel nut. Behind him, a soldier picks up his assault rifle to emphasize that it would be a good idea to immediately turn back to the city of Kengtung. Special Zone 4 is spread out behind the checkpoint, with picturesque mountain vistas, lush jungle forests and the notorious casino town of Mong La. The area is also home to drug cartels and rebel groups, including the dominant National Democratic Alliance Army (NDAA), a rebel group that emerged from the Communist Party of Burma. 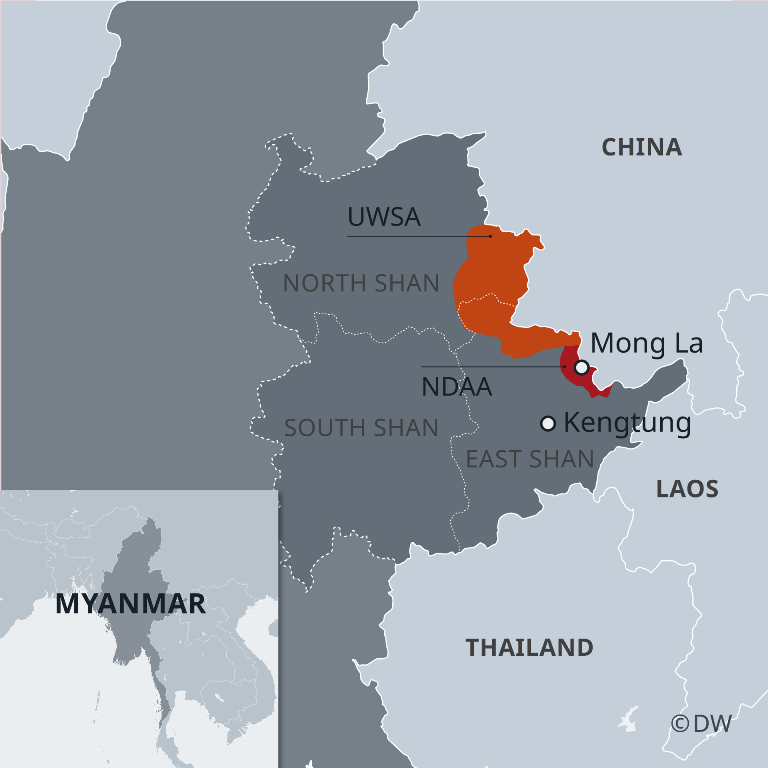 The NDAA is allied with the United Wa State Army (UWSA), a 20,000-strong militia of the Wa ethnic group that rules the adjacent “Special Region 2” and has strong ties to Myanmar’s military. Rulers in the eastern part of Shan State maintain excellent relations with their neighbor China. Chinese is often spoken instead of Burmese, Chinese yuan is widely accepted as currency and calls are made using Chinese networks. Chemical precursors for drug production are also delivered from China, apparently without problems at the border crossing. The finished product is then cooked up in tented drug labs out in the jungle. Back in Kengtung, a representative of the Burmese Immigration Service told DW that Special Zone 4 is a “powder keg” at the moment. “Drug-related conflicts between militant groups are omnipresent. That’s why we don’t allow foreign visitors to travel to the region. Many areas are even closed to the local population,” the official explained. However, the official didn’t mention how Myanmar’s army, as well as militias allied with it and rebel groups in Special Zone 4 all benefit a great deal from drug production. According to a recent report by the International Crisis Group (ICG), such enclaves are under “full territorial control of armed groups that have entered into permanent ceasefires with Myanmar’s military.” This offers ideal conditions for the undisturbed production of crystal meth on an industrial scale. “Good infrastructure, easy access to necessary chemicals from China, and safe production facilities under the protection of government-affiliated militias and rebels in enclaves make Shan State a major source of high quality crystal meth,” the ICG report continues. The booming drug industry in Shan State doesn’t look like it will slow down anytime soon. The recently approved multibillion-euro “China-Myanmar Economic Corridor” (CMEC) project, is set to bring refurbished roads and modern high-speed railways to the region. In the future, the eastern border region of Myanmar could be better connected with China than with western Myanmar. These improvements could also promote illegal activity. And as long as Myanmar’s autonomous zones continue to exist without any outside pressure, the drug trade looks like it will continue to flourish.